It’s pretty common knowledge that trees make a positive difference. 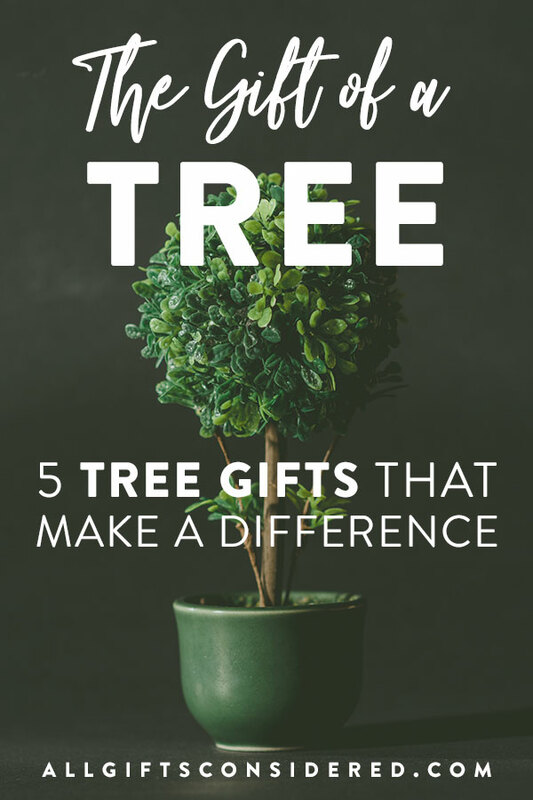 Before we dive into looking at tree gifts, let’s review a few specific ways that trees – any and all trees – make a difference in your life and for the environment. These details were adapted from the National Wildlife Federation and the NC State University Cooperative Extension. For these reasons and more, giving the gift of a tree will make a difference in the life of the recipient and will benefit the local environment. All this, and we haven’t even mentioned one of the best parts: Trees are beautiful! It’s a delight to see the branches of a tree swaying in the breeze, or to enjoy the shade of its leaves, or to see the birds make a home in it, or to partake of its fruit. Trees enhance the beauty of the world. So for all these reasons (and I’m sure there are more), trees make a great gift. Seeds – Give tree seeds for the recipient to plant and grow their tree. This requires a lot of work, however, so unless you know that the person has a strong desire to plant a tree from a seed, I would avoid this option. Saplings or small trees – In my opinion, this is the idea tree gift. A small tree or sapling is small enough to be transportable, and can even be kept in the house. The recipient can also choose to plant it anywhere they like. A great gift. Tree planting – For a simpler, nobler gift, consider having a tree planted in honor of someone. 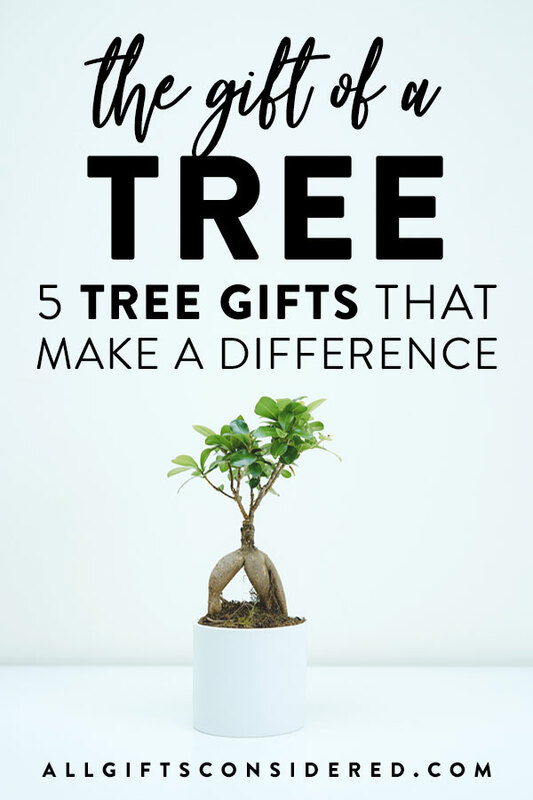 In this case, the gift is more focused on the tree planting making a difference than the person actually receiving a physical object. You purchase a tree that gets planted in a needed area in the forest, and the recipient gets a card or certificate with information about the tree. This ideal for giving as a sympathy gift, or for someone who is passionate about conservation. When you give a tree as a housewarming gift, your gift says something about what it means to make a home. A tree symbolizes taking root, thinking long-term with slow yet enduring growth, health and fruitfulness, beauty, and life. 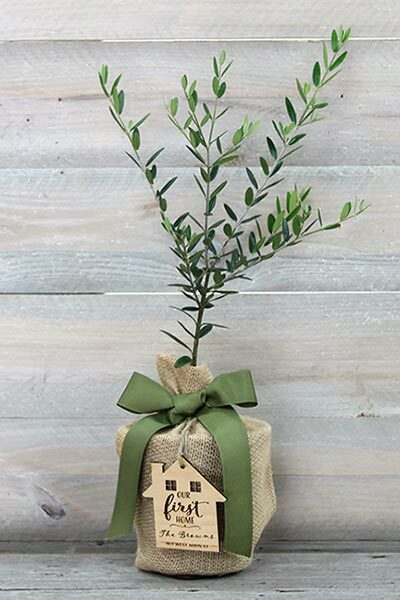 The housewarming tree gift above is an olive tree from Seeds of Life, and includes a personalized keepsake house ornament. Olive trees can be grown indoors or out, and symbolize friendship, peace, and prosperity. How it makes a difference: A housewarming tree can be planted indoors, affording natural beauty while aiding with air purification and improving mood. Planted outside, the tree can provide shade and wind blockage, mitigate soil erosion, increase home value, and more. Plus, a tree housewarming gift isn’t some trinket that will end up in a landfill someday. For a meaningful sympathy gift, consider giving the gift of a tree. This could be a tree that you send or hand to the grieving family; a gift similar to the housewarming tree mentioned above. Or, perhaps better, it could be a tree planted “in memory of” the deceased in a national forest to help restore wildfire devastation. 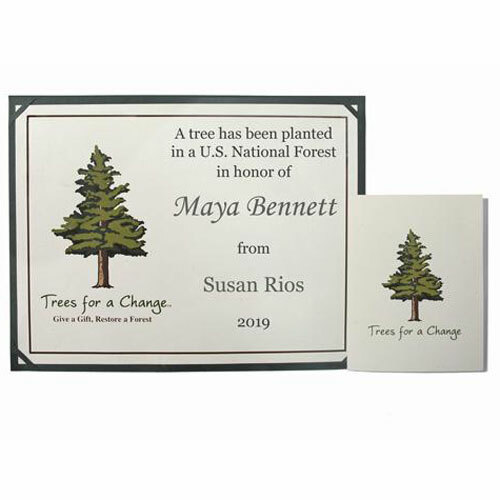 With the gift of a tree planted in honor of a loved one, your recipient gets a lovely card or certificate, plus information about exactly where the tree is planted (photos and GPS coordinates). The tree itself is planted in an area affected by wildfires, chosen by the national forest experts to help restore the devastated forest area. Each tree is maintained and protected, so you know the tree will never be cut down but instead grow and thrive for generations. You can order a memorial tree (or grove of trees) from Trees for a Change, and you can learn more about their process and the benefits here. How it makes a difference: These are trees that would not be planted otherwise, so your purchase literally does make a difference. Specifically, the tree planting helps restore our national forests, providing all the benefits mentioned at the start of the article. Also, when sent in place of sympathy flowers, you are planting a tree that will provide benefits for generations rather than supporting an industry focused on the quick growth and cutting of short-lived florals. The gift of a fruit tree is a lovely alternative to many traditional choices such as flowers or gift baskets. 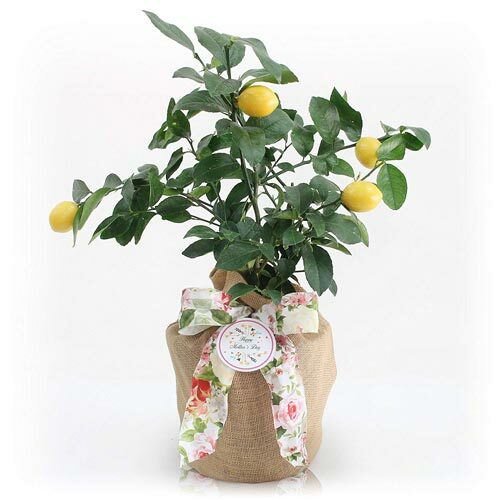 The lemon tree (available in several styles like housewarming or birthday, shown above for Mother’s Day) is a great gift because it is not some little trinket, but rather a fruit-bearing living tree that can grow and thrive for years, providing fruit, beauty, and shade. Lemon trees can grow indoors or outdoors, as can many other fruit trees. This allows the recipient to keep the plant inside for as long as they like, and if they ever want to change things up they can simply plant it outside. Ideal fruit trees to grow inside include lemons, limes, oranges, bananas, peaches, apricots, and nectarines. How it makes a difference: In addition to the benefits provided by any tree mentioned above, fruit trees help save money on groceries, provide a naturally-grown healthy snack, and can provide a sense of pride and joy that comes from caring for a living thing and partaking of its fruit. If you are looking for something special to give as a wedding gift that perhaps isn’t on the registry, consider giving a tree. As noted, trees are deeply symbolic, often used to represent life, beauty, growth, family, strength, renewal, abundance, and much more. The rich meaning combined with the natural beauty of the tree make it a truly unique wedding gift. 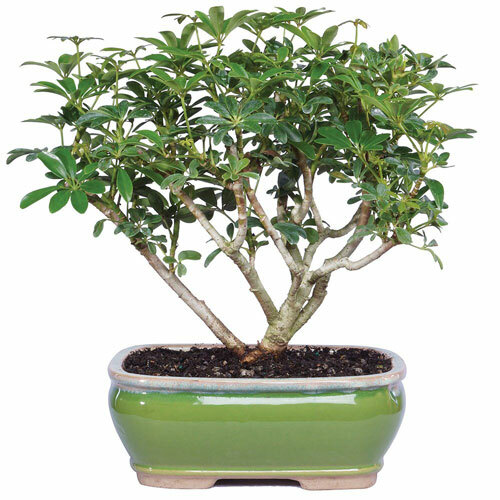 A bonsai tree is a particularly good choice for a wedding tree gift. It’s small and easy to care for, will fit into any newlywed couple’s home or apartment, and carries the symbolism of harmony, balance, and all that is good. How it makes a difference: A tree in the couple’s home has a peaceful, soothing effect. It adds grace and beauty to the decor while helping to purify the air. It’s also something that they can care for together and watch grow, perhaps planting in the yard of their first home bought together. Gift donations to plant a tree in someone’s name is our final tree gift idea. This is an option to have a tree (or many trees) planted out in national forests where there is the greatest need. It makes a great gift for those who don’t have time, space, or energy to plant or take care of a tree themselves. Plant a tree gift donations can be a corporate gift to commemorate a business relationship, a thoughtful gift for an earth-conscious individual, a special way to celebrate a retirement or other special occasion, and much more. 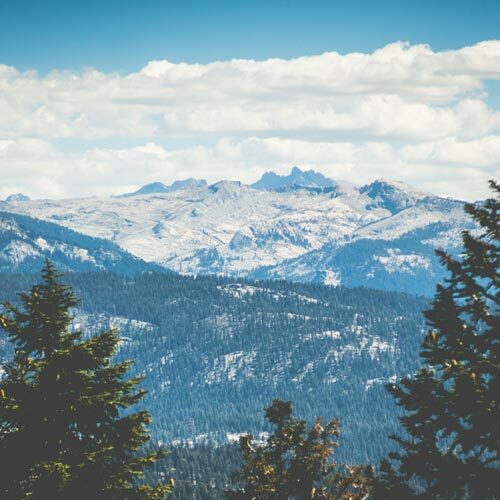 How it makes a difference: We all depend on the national forests for many reasons, including economic, environmental, health, and heritage factors. When you give the gift of a tree planted in a national forest instead of a more traditional gift, you’re giving back to the environment rather than taking from it. Well-maintained national forests help improve air quality, create habitats for wildlife, reduce flooding and erosion, and help keep our planet looking beautiful. Donate. Hit up Trees for a Change for a great tree gift, which results in trees planted in forests devastated by wildfires along with a lovely certificate sent to your recipient. Do it yourself. Pick up an attractive planter, some soil, ribbon, and a gift card, then choose a tree from your local nursery. Put it all together and you have a great tree gift that truly makes a difference.